Flo-tech’s Classic Turbine Flow Sensors measure the flo rate of hydraulic fluid and other compatible liquids. Offered in a choice of high strength anodized aluminum or Stressproof ® steel bodies, these durable flo sensors are capable of withstanding pressures up to 6000 PSI (414 Bar).The Classic Series with the standard magnetic pick-up provides a frequency signal that is proportional to flo rate and can be transmitted to Flo-tech’s F6600/F6650 Series digital displays. 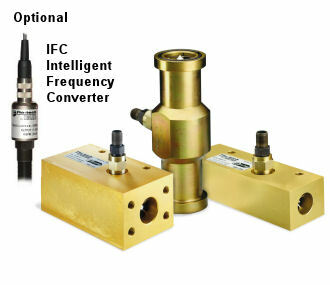 If an analog output is preferred, these sensors are also available with the IFC (Intelligent Frequency Converter) which offers either a 4-20 mA or 0-5 VDC output signal, allowing easy integration with Flo-tech’s F6700/F6750 Series digital displays, PCs, PLCs or other data acquisition devices.